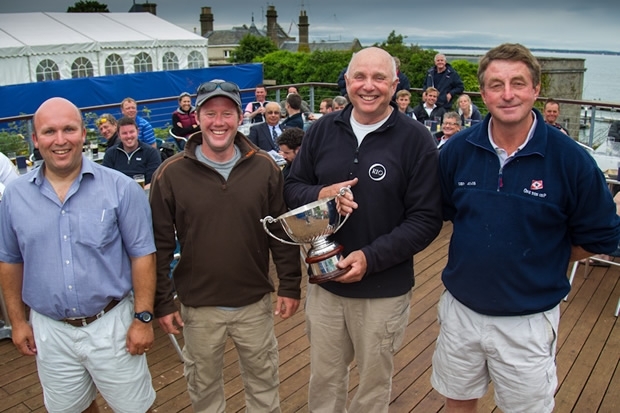 As close finishes go the final day of the Coutts Quarter Ton Cup 2012 was certainly up there with the best of them. Going into the day Peter Morton's 1978 Fauroux design had a three-point lead over Sam Laidlaw's 1990 Vrolick-designed Aquila, being helmed today by John Greenwood. Anchor Challenge, a 1978 Farr design helmed by Paul Gibbons, was six points back in third on 40 points with Alice II, Rickard Melander's 1990 Morrison, lying in fourth on 49. The first race of the day, the seventh of the nine race series, saw the discard come into play and with several of the top boats counting a black flag disqualification from race six there was plenty of room for manoeuvre in the overall results. Race Officer Rob Lamb and his Committee, the core of which will be officiating on the RS:X course at the Olympic Regatta in Weymouth, did an excellent job to complete the final three races scheduled despite very variable breeze. The unpredictable wind and a strong tide gave the sailors plenty to think about and ensured the fleet was constantly shuffling places with surprises and dramas at every turn. Race seven set the tone of high drama when a number of teams misjudged the strength of the tide, resulting in a series of mark one pileups. After that the day just got more and more exciting with some of the closest racing you could hope to see anywhere in the world. Despite being one of the boats caught up in the race seven mark rounding debacle, ultimately Peter Morton and his crew claimed a record third Coutts Quarter Ton Cup win by just four points from Alice II with Aguila third and Anchor Challenge fourth. This achievement was impressive not only because it was the first time the event has been won by the same person three times but also because Peter and his team have used three different boats for their wins. In the Corinthian Division for the all-amateur crews Irish Young Sailor of the Year George Kenefick sailed Tiger, the 1989 Fauroux design he owns jointly with his father Neil, to victory ahead of Sergeant Pepper, Richard and Anne Thomas's Bolero, which was designed by Richard's father David. Third place went to Paul Kelsey's Runaway Bus, a 1977 Whiting design, with Love In A Mist, a 1974 Waarschip owned by Eric and Philip Williams - the oldest boat in the regatta - fourth. The racing results only tell part of the story of the Coutts Quarter Ton Cup, which is as much about the fun of finding and loving these very special historic little boats and sailing with your old mates, as it is about winning. A quick look around the fleet reveals that what ever the age of boat, whether she's been professionally restored or is lovingly maintained by her owner and crew, each is a little masterpiece in her own way. Many of today's leading designers cut their creative teeth in the class. The boats have character, they're quirky, some of them are downright strange to look at, but they all entrance both their owners and those who sail them. There are a couple of very special boat mentions to make in this report. The first is Atalanti IV, owned by past ISAF Vice Chairman and sailing legend George Andreadis. George commissioned Atalanti IV for the 1991 Quarter Ton Cup. Design by Rob Humphries the boat ran late and only arrived just in time for the event where she finished fourth. Having completed that '91 Cup George then put the boat into storage in his infamous Athen's boat shed and never sailed her again. Until that is, Morty persuaded him to bring her out of retirement for the 2012 Coutts Quarter Ton Cup. A good wash and brush up later and not only did she finish a very creditable eighth but she was also chosen as winner of this year's Marineware's Concourse d'Elegance, for the best-presented yacht at the regatta. The other special mention has to go to Freres-sur-Mer, a 1981 Fauroux design owned by Holland's Theo and Andre Bakker. This was her first ever Coutts Quarter Ton Cup and the boys threw themselves into the spirit of the event with gusto. Whilst they may have finished in last place their results were somewhat hampered by a black flag and two did not starts on the first day courtesy of a broken traveller. The fact that they are still sailing with a 1984 mainsail might just have had something to do with it too! It was wonderful to have them join the fleet and at the prize giving they were presented with a roll of duct tape to help with running repairs and a packet of handy Solent navigation chart napkins to ensure they can find their way back for the 2013 event. A look around the crews is revealing too as the fleet without doubt attracts some of the best sailors in the world. Not for big money, but because they want to sail with their mates and they too love Quarter Tonners. This year's rogues gallery included the likes of World Match Racing Champion Ian Williams, America's Cup veterans Don McCracken, Dave Scott, Ethan Bixby, British Olympians Stuart Childerley and Andy Beadsworth, David Howlett, Kelvin Rawlings, Jason Carrington, Ian Southworth, David Bedford, John Greenwood, Mike Budd, John Brinkers, Nigel Young, Irish Olympian Mark Mansfield...... and the list goes on. Once again a fleet of sailors has gone home at the end of the Coutts Quarter Ton Cup with a sense of achievement, lots of like-minded new friends and some wonderful memories. Our thanks go to event sponsor Coutts for their most generous long-term support of the event, to Class Secretary Louise Morton for her tireless work in making the regatta happen, to the Race Committee and to the members and staff of the Royal Corinthian Yacht Club. There are still Quarter Tonners out there in need of a good home so if you feel you could give a down at heel Quarter Tonner the love and attention she needs please contact Quarter Ton Class Secretary Louise Morton louise@quartertonclass.orglouise@quartertonclass.org, who manages our rehoming programme.